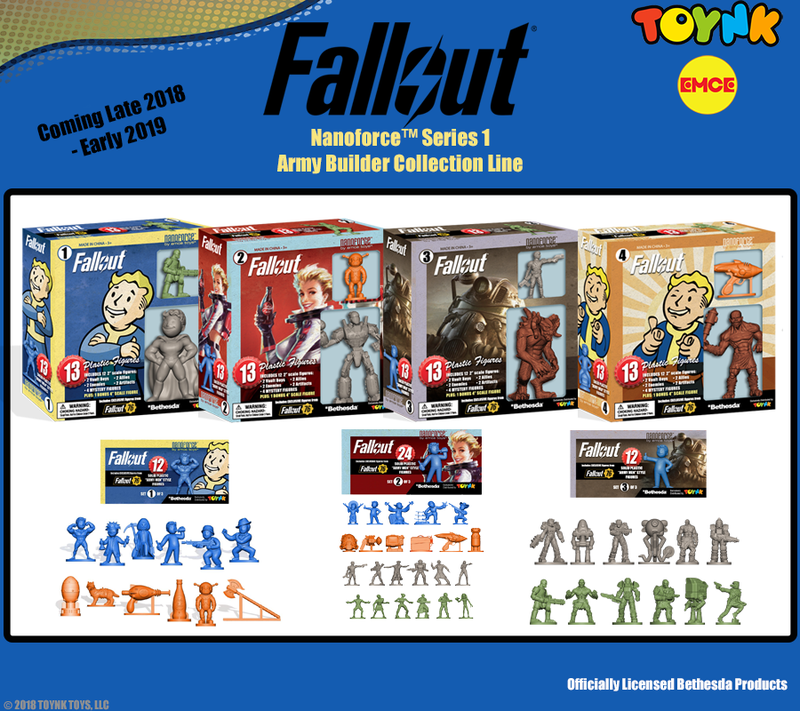 ADDISON, Ill., November 18, 2018 (Newswire.com) – Toynk Toys has officially announced their newest product line by EMCE TOYS, featuring figures from the hit video game franchise, Fallout. – The new line will contain a total of 52 collectible figures, ranging from characters, artifacts, to weapons found in the Fallout gaming franchise. – Offers gamers a second chance to own their own Fallout figures similar to those of Bethesda’s now sold out Fallout 76 Armor Edition. The Fallout Nanoforce™ Series 1 Army Builder Collection includes 52 highly detailed, army men styled figures from the Fallout Universe, designed for die-hard Fallout fans who want to decorate their vault with the newest collectibles found in the Wasteland. The Series 1 Collection will be packaged in collectible boxed and bagged sets, and will be released in phases, starting from late 2018, to early 2019. Bag 1 can be ordered now at pre-ordered now at Toynk.com. All products are officially licensed by Bethesda and will be exclusively distributed by Toynk Toys. Each figure is digitally sculpted for maximum detail and authenticity. Products will be packaged in 4 collectible boxed sets with 3 “drugstore peg” bagged sets. Box sets can be Play or Display. This allows your figures to be safely returned back to their package after opening. Boxed Sets will feature 12 two-inch figures and 1 four-inch bonus figure. Bagged Sets 1 & 3 will include 12 two-inch figures. Bagged Set 2 will include a total of 24 two-inch figures, making it the deluxe edition. A select number of boxed figures will remain a mystery, offering a surprise to any Fallout fan looking for an entertaining surprise. Here’s your chance to get your own set of Fallout & Fallout 76 figures! Fallout Nanoforce™ Series 1 Line can be found and pre-ordered at Toynk.com. ABOUT EMCE TOYS: In 2006, EMCE TOYS was started to relaunch the classic “Mego-style” clothed, posable action figures of the 1970s. Since then, EMCE has manufactured dozens of different product categories, from toys to office products and housewares for brands as diverse as Star Trek, Rob Zombie, Harry Potter, and Impractical Jokers. EMCE’s parent FOURTH CASTLE also produces, designs, sources and manufactures all kinds of products as white label service for several other pop-culture consumer products companies. ABOUT TOYNK: Back in 2001, tired of the boring corporate grind, three friends: Steve, Ron & Mike, hatch a brilliant plan to develop a company centered on fun products. What couldn’t be more enjoyable than a business selling costumes, toys and collectibles? The Toynk Toys team has since grown and varies from 40 to 200+ diverse, fun-loving people, depending on the season. Today, our Addison, Illinois location boasts a 125,000 square foot facility; home to our offices, retail store, and warehouse. Visit us at one of the 200 toy shows/Comic-Cons we attend worldwide yearly. Toynk Toys aims to deliver an ever-expanding array of cool costumes, geeky toys, and hot collectibles. Our team comes together each day, working hard to improve our customers’ experience. It’s not really considered work when we know that our products bring adventure, joy, and happiness to life. It’s no wonder that we love what we do, and we love doing it for you!